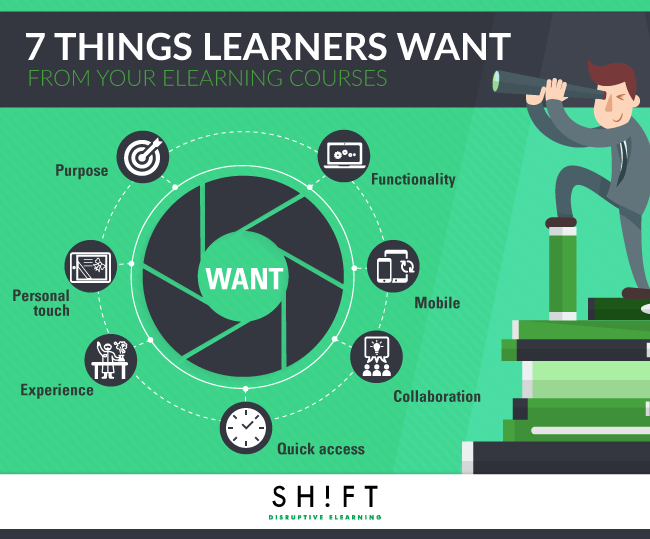 Consumers of corporate training and eLearning (aka. Your learners) are changing – fast. Their priorities, training needs, and methods of learning are diverging from the well-beaten paths we've mapped out in the past. 1) They want courses that work. Many learners these days are from 'generation Y or Z'. That means that they've grown up with the Internet, had access to it in school, and are early-adopters of new technology. Older learners are also becoming more and more technologically literate (even my 86-year-old grandmother uses Facebook!). That means eLearning that's not been thoroughly developed, tested, and re-tested is going to stick out like a sore thumb. It sounds obvious, but where before tech glitches might have been explained away as 'just a bug,' that won't cut it with the 2016 learner. If you aren't able to make your courses work, they're not going to respect your message. 2) They take the 'M word' seriously. There are few love affairs more passionate than that between the human race and the mobile phone. No matter who you are, everyone loves their mobile, and a staggering four out of five people even sleep next to their phone. So it's clear that we live and breathe mobile, and 2016 is set to be the biggest year for mobile technology yet. So then why, according to research by Bersin by Deloitte, is only 12% of learning mobile-enabled? That's a cause for concern. It's time for us as learning professionals to combat this disjunctive and bring our eLearning into the mobile world. If not, we run the risk of being hurled into the abyss of obsolescence, along with the VHS, Mini-disk and HD-DVD. "More than 70% of employees use search engines to learn what they need for their jobs; will unlock their smartphones 9 times an hour; and watch videos for no longer than 4 minutes". Source: “The Modern Learner” Bersin by Deloitte, 26 November, 2014. 3) They want collaboration, not just "experts". Who do you learn the most from? Is it leaders with letters after their name, or your friends and colleagues? Most of us feel that colleagues, friends and family teach us more than experts. Collaboration then is a great way of fostering learning. But the statistics show that this doesn't translate into corporate training. Bersin-Deloitte reported recently that while 87% of workers say sharing knowledge with co-workers is vital for their jobs, only 34% of the L&D organizations they surveyed were investing in social learning tools. So for 2016, it's all about making the collective knowledge more available in learning programs, encouraging social interaction, and including flexible collaborative elements. 4) They want to access content in a split-second. This should go without saying, but Google is go-to for most questions. Sometimes, this is great, but it can also lead to inaccurate information and less-than-ideal employee education. So we need to avoid the 'Google reflex' by making sure our eLearning programs, directories, and extra content is easy to find and access. Like, really easy. In big letters. With arrows. We're serious. 5) They want an experience, not a presentation. In the modern world, it's getting more and more difficult to really 'switch off' from the screen. Often we transition from one program to another and one Internet window to another without really focusing. Use experiences, multimedia, and content that speak to all of our senses: this could be music, colors, interactivity. It's a shame we can't (yet) do smells – my high school English teacher would give us lavender to put in our books, and it really helped get and keep our attention. Music, icebreakers, collaborative games, or video can all be great ways of giving a multi-dimensional eLearning experience. 6) They want the personal touch. We have to keep in mind that as consumers, we expect an ever-greater aspect of personalization and customization. Things we eat, wear, buy, and use, are increasingly personal. We ask companies to treat us as a market of one. This even shows through annoying Internet ads – they pick up on who we are as consumers and tailor the banner ads as necessary. But that doesn't mean we should delve into personal information or try and create a welcome message that says 'Hello Steve, how was your morning vanilla latte with soy milk?” Instead, we can encourage learners to reflect on their learning style, and be even more assiduous with our needs analysis – a tool that's all too often lost in a sea of proposals and storyboards. 7) They want more than money; they want real purpose. Millennials will account for 75% of the workforce in 2025, and despite struggling with debt and the crippling economy that's typified their generation, money isn't going to swing it for them. We're dealing with a generation who've grown up seeing the effects of corruption and financial turmoil, and they're fed up with it. This has to feed into our training strategy, and rightly so. We need to recognize that workers have never been motivated by just money, but nowadays they are even less so than before. The millennial generation identifies strongly with working for the greater good and making the world a better place. Great, right? This isn't just blabber either – in one study 50% of millennials said they'd prefer to have a lower salary but find a workplace that matches their values, and a staggering 90% said they wanted to use their skills for good. HR departments need to invest in training that helps learners see the bigger picture – how it will develop their skills, how it can fit into their core values, and what the overall 'why' is. This is no easy feat, but if you can show learners how their learning fits into the jigsaw of their lives, then your learners will be putty in your hands. “The Modern Learner” Bersin by Deloitte, 26 November, 2014. Poswolsky, Adam. What Millennial Employees Really Want. June 4, 201. Read here. Blake, David. Putting Learners First in Enterprise Training. May 12, 2015. Access here.